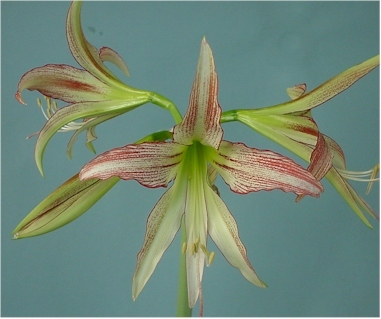 This is the Amaryllis shown on the right in ful bloom! The spidery flowers are typical of cybister hybrids, though not as extreme as some of the more spidery-looking flowers. TEMPERATURES: Temperatures of around 65° are perfect and will result in longer-lasting blooms. WATER: Freshly potted bulbs, or those that are just emerging from their rest period, after dormancy, must be watered sparingly. Why? 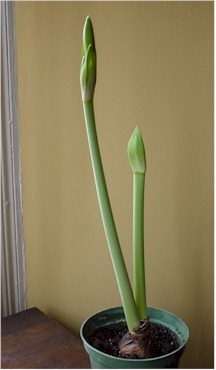 Because at this stage of growth the bulb has very few active roots. If you water the plant too heavily, chances are that the bulb will rot. Keeping the potting mix barely moist, encourages new roots to grow down into the mix. Don't worry, the bulb has adequate stores of water and nutrients for the emerging buds. If your plant has not been dormant over the winter months, you should be able to water it more, as it will already have an established root system. At this stage flower buds emerge and are getting ready to bloom! Do not move your plant about too much as the buds open. They will naturally open up beautifully arrayed on a stem. all four flowers are open togetherfor a brief period. 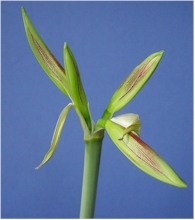 Most bulbs produce 4 flowers per stem, but larger plants can produce5-6 on occasion though usually only about 4 blooms are open at the same time.